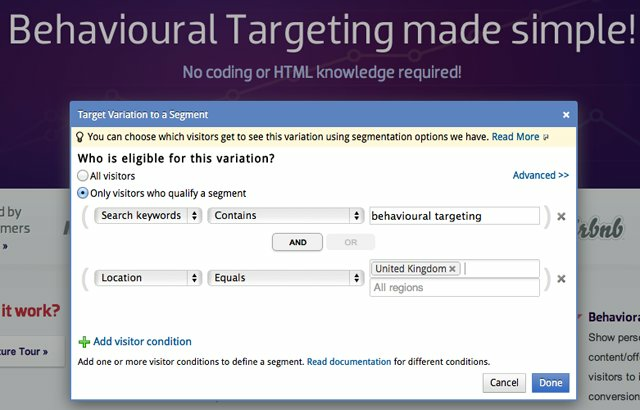 We recently launched geo-behavioral targeting feature in Visual Website Optimizer. (We also launched usability testing module; our vision is to offer all tools and techniques a marketer would need for conversion rate optimization). People use A/B testing, multivariate testing, analytics and usability studies for improving sales and conversions. However, I feel behavioral targeting is massively underused. Part of the reason could be due to difficulty of implementation, but with tools like ours (and others in the market), it is becoming easier by the day to get started with all sorts of targeting and personalization campaigns. Different visitors behave differently on your website. The traffic you get on your website is composed of visitors with different intentions: some are on your website for purchasing your products, some are there for joining your organization (finding careers page), some are there for simply researching, and others are probably there by mistake and have not even tiny interest in what you are selling. Most websites and landing pages on the Internet are same for all these different kinds of visitors. That is why we see websites crammed with multiple call-to-actions (buy now, sign up for newsletter, free trial, like us on Facebook, and what not). These websites try appealing to all sorts of visitors, but finally, end up appealing nobody. In my landing page optimization tips article, I recommended knowing who your target customer is and having only one clear call to action button (and thereby neglecting other visitors). 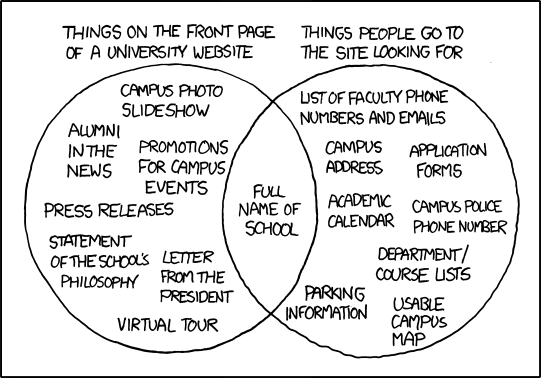 But, isn’t it a much better idea personalization of website or landing page for each kind of visitor? Imagine having one call to action personalized to each visitor type. Behavioral targeting lets you achieve precisely this. Def. Behavioral targeting is a method using which you can target different content, offers, variations or campaigns to different visitors depending on their behavior and attributes on your website (and off your website too). There are many more variables (including using custom data such as gender, age, etc.) which can be used for targeting. So, behavioral targeting must be hard? Actually, no! On the surface of it, though, implementing such a technology does sound like a mystery. The work involved in creating specialized content and offers for different visitor segments seems pretty intimidating. Moreover, even if you have got the creatives done, who would implement the technology behind determining attributes of a visitor and then showing the targeted content? Well, for this either you can cook up your own technology (like many big firms such as Amazon, eBay, etc. do it), or use one of the platforms (like ours). So, for example, our default headline is ‘Increase your website sales and conversions‘, but if someone from the UK searches for ‘behavioural targeting’ and ends up on our homepage, customizing the headline for him/her would be as simple as a few clicks and a couple of keystrokes. The possibilities are endless. But, how do you find out which segments to target? The first step for behavioral targeting is to understand your visitor mix carefully. You have to know who your majority of visitors are, and if they naturally fall into different segments. For this not only you have to use your website analytics program, but you also have to use your business, domain and product knowledge. For example, for Visual Website Optimizer, we know that our visitor primarily fall into 3 categories: small businesses, enterprises and agencies. Further, their interests are usually in A/B testing, multivariate testing or behavioral targeting. We can drill down further and see from which countries do maximum of our customers belong to. Based on all these variables, we can setup a very effective behavioral targeting campaign. Whether customizing key pages in local languages for our visitors from Netherlands, Japan, China or other countries increases conversions and sales? Whether we can recommend certain plans (such as small agency, enterprise or agency) depending on which keywords a visitor searched for (for example, our hypothesis is that ‘a/b testing tool’ is mainly used by small businesses, while enterprises generally use ‘a/b testing solution’ or ‘a/b testing platform’)? Whether it makes sense to prioritize certain features on homepage (depending on what they searched: ‘a/b testing’ or ‘multivariate testing’), or depending whether they came from LinkedIn or Facebook or Twitter? Only after statistical significance is reached for these tests, do we go ahead and implement these targeting campaigns permanently. Transitioning from A/B tests for specific segments to permanent behavioral targeting is very easy. Simply clone an A/B test and setup targeting for the variations. What has been your experience of behavioral targeting? Great Article. I agree with you that Behavioral Targeting is the most underused technique in today’s marketing. One more thing to consider is historical behavior of the customer. Based on that we can determine in which content the visitor will be interested in. Apart from this time of visit. Sometimes that also give insights. I found that visitors on mobile website on Saturday turned more into buyers. May be because on weekend in golf field they wanted to buy any equipment. So they start browsing mobile website. Keeping this in mind we can customized our content. You guys continue to impress us. VWO is really putting themselves ahead of the competition. When we target multiple countries we invariably create many different landing pages for each country, this just makes it that much easier. We dont get any SEO from it but its great to determine which countries convert best with paid advertising.